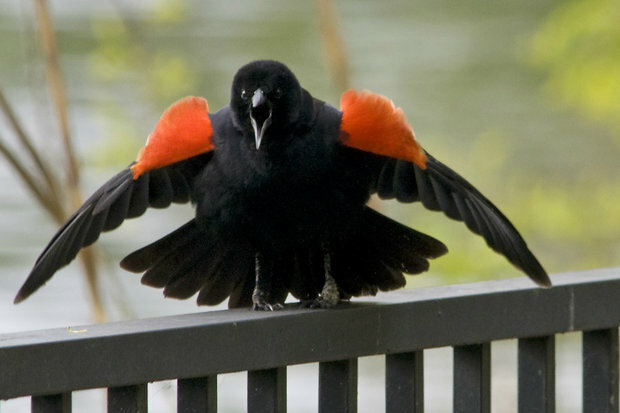 Red-winged blackbirds are known to swoop down on humans while protecting their nests. 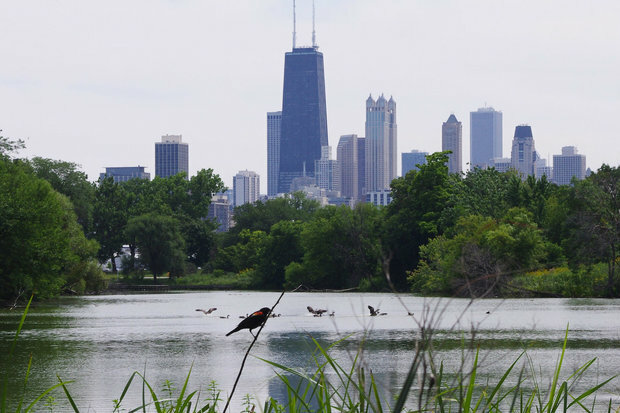 Field ornithologist Josh Engel said it "is definitely a seasonal thing," adding, "They are a migratory species, and generally in Chicago they arrive for the spring in late February and early March. Red-winged blackbirds like marshy areas, where they can be found in the city. "They don't get aggressive until they are well into the breeding season and have a nest to protect. They are highly territorial, aggressive to almost anything that comes too close, especially things that are bigger than they are and that they see as a threat, including hawks, crows, cats and people." This time of year, even robins can get surprisingly ferocious, as they protect their young as they learn to fly after flopping out of their nests. But red-winged blackbirds are even more territorial. Environmental-science consultant Beth Kosson, a DePaul University graduate, has called them "nature's a--holes," comparing them to a bickering New Jersey couple. "The female will sit there on the nest and then the male tries to muscle out the humans — the whole time the female is watching, egging on her man. 'Get 'em, baby. Get 'em good,'" Kosson said. "Bunch of a--holes they are." Fortunately for Chicagoans who like to stroll around outside when the weather is agreeable, the territory red-winged blackbirds prefer to occupy is relatively remote in the city. "Peterson First Guides" to North American birds says they like "marshes, swamps and hayfields." That, of course, means they're more likely to be found along the lakefront, in Lincoln Park, but also Grant Park as well, as WBBM-Channel 2 reported a few years ago. Red-winged blackbirds have a distinctive trill, as heard on an "earbirding" website compiled by Nathan Pieplow, author of the "Peterson Field Guide to Bird Sounds." But they also have what Pieplow calls a "fight song" that's more percussive, so keep the ears open for that. As a migratory species, they'll be moving on soon enough. In the meantime, Engle advises anyone encountering one to do the same. "The aggressiveness will last for a few more weeks, then will cease," Engel said. "The best way to avoid a blackbird in attack mode is simply to move on and get out of their territory."